Houses in England are very clearly divided, and structured, giving thought to various practical issues, such as sunlight, and privacy. In contrast, houses in Bali are designed with the community at heart. 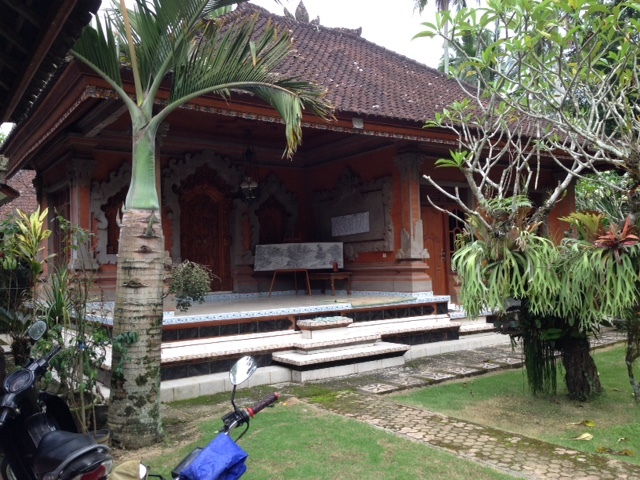 Where English people hide behind closed doors, Balinese houses are open to all. A visit to a rural village in Bali is a fascinating experience, as not much has changed for hundreds of years, despite various upheavals such as Dutch colonialism, Japanese occupation and full scale tourism. Once you are away from the busy tourist hubs, life takes on a whole other feel. The pace slows right down, as villagers go about their daily routines, with no thought for time. A traditional village consists of family compounds, lining dirt lanes, shaded by trees. Each compound is separated by low walls, or fruit trees. Everyone walks freely from one compound to the next. The concept of privacy does not exist. The village center has a banjar building where everyone congregates for regular meetings, and various musical practices. Decisions are made as a group, for the benefit of the community. A friend of mine once likened the Balinese to bees in a hive, which is an interesting and pretty apt analogy. Just as bees have a way of communicating with the hive, the Balinese have their own signals. There is a large wooden gong that is used to summon the villagers in times of emergency, such as a fire, or to inform of a death. Each event has its own specific beat. The compounds themselves have a very clear structure, based on physical and spiritual elements. There is only one main entrance, and once inside, you will encounter another low wall. This is put there deliberately to confuse uninvited spirits. Spirits are believed to only be able to move in straight lines, so this obstacle will prevent them entering the house. Once inside the compound, the layout is based on human anatomy. The head is to the North, and is where the family temple is placed. This consists of at least five separate shrines, that are blessed daily with offerings. 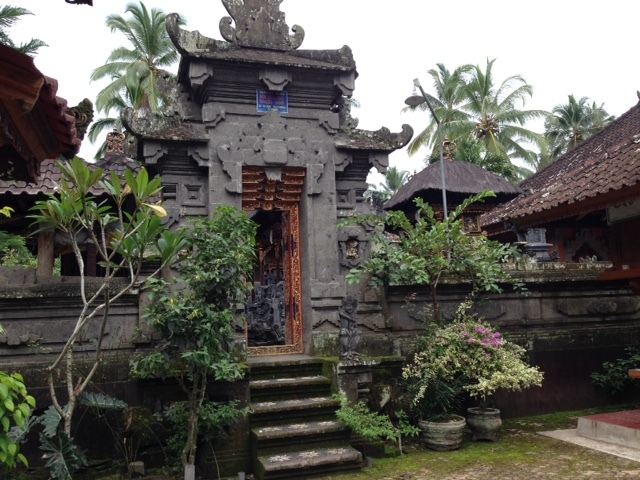 Here is the entrance to our family temple: Beside the temple are the bedrooms, which represent the arms: The doors to the bedrooms are made of intricately carved wood, and can even include gilding. To the East is the Bale Dangin, which is where the offerings are prepared, and there is also a bed which is used to lay dead bodies as they are prepared for cremation. I will talk more about that in another post, as we are preparing for my father in law’s cremation this week. The courtyard represents the navel, and is where the family congregates, there is a rice grain storage facility, that provides a great place to sit and chat with neighbors and family: Finally, to the south is the kitchen, representing the legs, which consists of 2 rooms, one open for cooking, and the other enclosed for storing the cooking materials: The bathroom is located behind the kitchen, and beyond that is where the livestock and vegetable garden is located. This compound can house up to ten families, as sons marry and bring their wives to live with them. 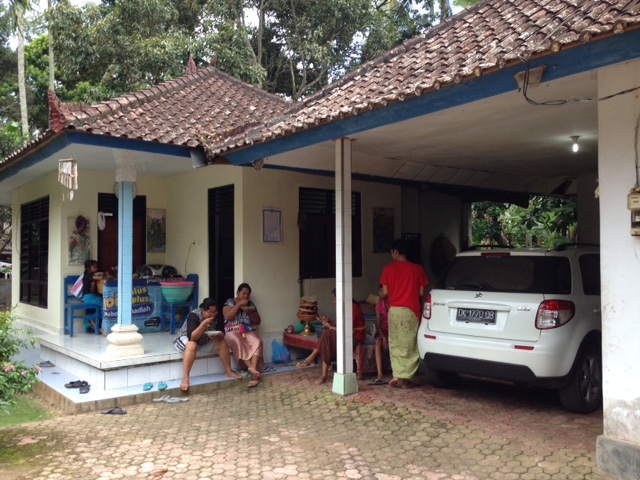 Balinese men never leave home, they simply expand the existing compound. In this way all generations live side by side, and the older ones look after the children as the younger generations go to work. This gives grandparents a sense of purpose and belonging that is sometimes lacking in the western cultures. I love this idea, and like to think my children will continue this tradition, and take care of me in my old age!! Or perhaps I am only dreaming! Yeni was trying to keep her voice low, and to encourage her husband to do the same, aware that the other people at the table could hear them. They both sat back in their chairs, facing away from each other. Yeni looked noticeably uncomfortable, while her husband also seemed a bit flustered. He was clearly the kind of man that is used to being treated well, and getting his own way. The young waiters had inadvertently upset him, and there was no calming him down. Despite his age, he was like a petulant child that was not getting what he wanted. He seemed unnerved, and this feeling increased as he watched his wife converse freely in her native tongue with the English woman next to her. Seeing the interaction between this German man and his Balinese wife, made me think about the various differences that exist between East and West. This behavior in public is one of the many conflicts that arise in a mixed relationship. Westerners are taught to speak up, demand respect and stand up for yourself. We are very individualistic, and come across very forceful, and almost brash. The Balinese on the other hand are all about harmony, keeping the peace, and avoiding confrontation. When I arrived here twenty years ago, I was a stubborn, outspoken young woman, and it went against every bone in my body to be calm and pliant. I clashed with my husband on a daily basis, but bit by bit he has managed to calm the wild child that I was! Sometimes I mourn the loss of the person I was, but mostly, I appreciate the person I have become. When East meets West, there can be bumps, but both sides can definitely benefit from the alliance. I like to think I have taught my husband a few things as well as learning from him. The Kecak dance is one of the most famous and popular dances in Bali, and it is a good representation of how life in Bali works. This dance consists of a group of men, in a circle, chanting together, and waving their hands around. Together they are effective, alone, it would not work. The Balinese society works in the same way. Everything hinges on the community, and the idea of everyone working for the good of that community. Individualism is frowned upon, and anyone trying to break away and do their own thing is shunned and considered arrogant. Each person is a member of a family, and their neighborhood community. All decisions are made as a group, and are based on age old traditions. For hundreds of years, families would work side by side in the rice fields, cultivating crops to sustain the community. The famous irrigation system that runs through the rice fields was devised so that all the fields would receive an equal amount of water. No one is better than anyone else. This can be seen in the names given to the children, everyone is either number 1,(Wayan), 2(Made), 3 (Wayan), or 4 (Ketut). By all having the same names, personal identity is blurred, and they are simply known by their position in the family. Life for the Balinese is ruled by the culture and religion. The women find it hard to hold down jobs, as their responsibilities in the village community are so many. They are the ones that have the task of making all the offerings for any ceremony, as well as making sure everyone is fed and watered. With the influx of tourism, and the lure of the mighty dollar, the Balinese are feeling pulled in two different directions. On the one hand, they feel an obligation to their community, on the other, they would like to earn more money to support their families. Its a confusing time for them, the youth in particular are moving away from traditions, at the concern of the elders. Meanwhile, the tourists are drawn by the culture, and want to keep the Balinese in their traditional state, to marvel at, and take pictures. But what is best for the local people? Should they be held back, and entrenched in their traditions, or should they move forward with the times?